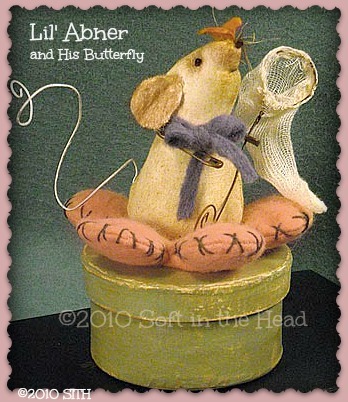 Little Abner is made from distressed muslin. He is a simple pattern with many potions. He can be placed on a mache box (pictured) a jar lid or just left on his wool felt flower and used as a pin cushion. He has a clay butterfly perched on his nose and rusty safety pins for arms. Directions include how to make the butterfly and how to distress the mache box. This is an original "Soft in the Head" design by P.K. Gracia ©2010....Pattern can not be re-sold online but finished pieces can be sold at shows and online as long as credit for the design is given to the pattern designer. No mass producing of finished piece please.